The Stargate is stolen, leading SG-1 to discover that the Trust has taken control of an advanced ship in orbit. Teal'c investigates a series of wide-spread Jaffa deaths. The next morning, Daniel Jackson questions the officers, but they reveal no information of value. Samantha Carter plays back the video feed where it is unanimously decided that the technology used to take the gate was Asgard. In a foul mood, Colonel Jack O’Neill calls the President and informs him of the bad news. Teal’c, receiving a “Do Not Proceed” response to his I.D.C., travels to the Alpha Site to consult with the officers there. They reveal that Earth may be compromised. Teal’c plans to return to P4S-161 to get a cargo ship to take back to Earth. For two days prior to the loss of the gate a small signal was detected, but no one thought anything of it until the Stargate disappeared. Reviewing video logs, it becomes clear that Dr. Kevin Hartkans, who has been with the base for seven months, placed something on the Stargate at the exact same time the anomaly was detected. Carter believes it was a “tag” so that Asgard transporters could detect the gate and beam it away. She requests N.S.A. satellite time to detect the signal. Teal’c arrives on P4S-161 and discovers the entire population of rogue Jaffa dead, save for M’zel, who only recently arrived. He takes Teal’c to the lair of the main camp, revealing hundreds of fallen warriors. Sam, Daniel and a small battalion of troops probe the location of the Trust’s signal, but find an empty warehouse, save for V.X. rockets and several cases of what appears to be nerve gas. When an elusive member of the Trust emerges and shoots at the team, he hits several canisters before Carter zats him down. Believing it to be too late, they await their death, but it never comes. Back at the S.G.C., Carter believes the Trust intends to launch a full-scale chemical attack against the Goa’uld, using rockets to convey symbiote poison, with no regard for the lives of the Jaffa. The man they caught carried only an Area 51 badge. 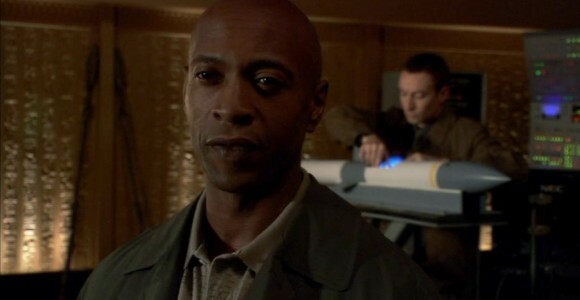 Carter and Daniel go to the Nevada base and meet with Dr. Bricksdale, requesting to see Osiris‘ hand device, capable of activating Asgard technology. They scan the device and it proves to be the genuine article, but is useless for getting aboard her cloaked ship. Meanwhile, M’zel has traveled back with Teal’c to the Alpha Site. He receives word that three more planets have been attacked. Millions are now dead. M’zel agrees to travel with Teal’c to P3S-114 (where a Tok’ra is concealed as a Goa’uld under Baal‘s authority) to inquire if her people are responsible for the demise of the countless Jaffa. Dr. Bricksdale meets with Trust agent Hoskins, hoping to neutralize their partnership, but Hoskins soon realizes that Bricksdale has been followed. After a brief skirmish he initiates his locator beacon, but Carter zats him before he can activate it. Instead, she takes it and uses it to get up to Osiris’s Al’kesh, where she is rendered unconscious by more of the Trust. Teal’c and M’zel allow themselves to be captured by Zarin’s Jaffa. When Zarin is informed, she immediately orders that they be brought to her. She is furious that they have risked blowing her cover, and tells them that she is obligated to torture them until Baal can arrive to watch them be executed. Meanwhile, Jackson interrogates Dr. Bricksdale, telling him that they can come to an agreement to keep the two million the Trust paid him for cooperation if he helps the S.G.C. regain Carter and Osiris’s ship. Bricksdale explains that he did manage to get on board Osiris’s vessel, but the hand device never left Area 51 (at least while it was on Earth). He used locator beacons to get the Trust aboard. Daniel pieces the puzzles together: the code Daniel translated for them was the very same one that gave the Trust access to the Al’kesh. Bricksdale promises he can make the wrist device work once more. Carter awakens to find herself surrounded by the Trust. Soon she confirms they are launching a chemical war against the Goa’uld. Their next target is P3S-114. As Zarin is interrogating Teal’c and M’zel, the rocket impacts, and all symbiotes, including Zarin and M’zel’s, quickly die, taking them along with it. Teal’c is the only one on the planet left standing. Daniel uses Osiris’s hand device to sneak aboard the Al’kesh and disable the cloak. Prometheus detects the ship, but he is soon captured. Aboard Prometheus, Colonel Pendergast requests that they take the vessel out before it has time to escape, but O’Neill does not give the order. Teal’c contacts the Stargate aboard the Al’kesh once again, and Daniel and Sam use that moment to take down two members of the Trust. Teal’c comes through and kills Hoskins with a staff blast. Before the Al’kesh exits into hyperspace, Carter uses a locator beacon to beam SG-1 and the Stargate into Prometheus‘s cargo hold. S.G.C. installs jamming beacons around the gate so that it can no longer be taken. Unfortunately, the Trust have a hyperdrive-capable Al’kesh and enough poison to wipe out half a dozen more planets. It might have been better if O’Neill destroyed the vessel when he had the chance. Asgard transporter technology has an extremely long range — at least as far as the Earth’s surface to a ship in polar orbit of the Moon. If the Trust has enough manpower, they could have sent people through the gate to planets devastated by the symbiote poison in order to loot the world for Goa’uld technology and ships. It is unlikely this is an immediate option for them, now that they no longer control a Stargate. 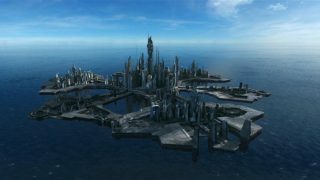 With a ship equipped with an Asgard transporter, however, it would be easy enough for the Trust to find another world with a Stargate and take it. A gate could even be used on or near Earth, though it would be a one-way trip unless the operatives wanted to return through the S.G.C. gate, which takes precedence. Alternately, if the Trust could get their hands on the Antarctic D.H.D. (not out of the realm of possibility, given their previous accomplishments in absconding with technology from places like Area 51), they could conceivably conduct a Stargate program of their own on Earth with greater ease. So far as the S.G.C. knows, the N.I.D. has been clean for over a year, but there are still many officers unaccounted for. Without sensors, Asgard transporters are useless without a “tag” to target an object or location. A locator beacon is required to lock on to a target. Besides Goa’uld technology, rebel Jaffa are also armed with Earth weapons. The Trust possesses enough symbiote poison to destroy several hundred thousand Goa’uld. They have managed to gain access to the formula the Tau’ri and Tok’ra were working on. This new version is more stable and far easier to manufacture, but just as deadly to symbiotes. The S.G.C. has agreed not to use it except in defensive situations. Area 51 personnel are not allowed to bring anything into the facility, not even their street clothes. They are subjected to a thorough search and scan before they are permitted to depart. Osiris’ hand device was coded to not only respond to naquadah, but specific DNA, meaning using the device is useless for getting aboard her cloaked vessel. Baal had a garrison on P3S-114, secretly commanded by the Tok’ra Zarin, until it was destroyed by the Trust. In exchange for cooperation, the Trust gives Dr. Bricksdale two million, which he puts into an account for the Cayman Islands. Prometheus is currently undergoing a refit. Apparently the symbiote poison forces the Goa’uld to release its own poison into the human hosts. Zarin’s host did not regain consciousness once the symbiote had died. After the Trust destroys the Goa’uld on P3S-114, they target P5R-357, but Carter says Baal abandoned the planet six months ago. It is likely she was bluffing. An Al’kesh cloak requires 60 percent of it’s power to be in use. The wrist device only allows one person to transport at a time. “There will be an episode called ‘Endgame,’ which will involve what I call ‘the heist to end all heists,’ and deal with those pesky, former rogue N.I.D. operatives.” co-executive producer Joseph Mallozzi said in an interview with GateWorld. “Apparently, the Trust have gotten their hands on a symbiote poison in concentrated form. They’re sending missiles filled with this stuff through the Stargate to whichever planet they choose to eradicate all the Jaffa there,” in order to eliminate the Goa’uld’s power base. “It doesn’t matter to them if they’re good or bad Jaffa. “My writing partner Paul had an idea: the Stargate is heisted from the heart of Stargate Command. That was the easy part. The challenge was coming up with a story that explained who took, why, and, most importantly, how? Well, worked out a nice little Trust / N.I.D. / rogue elements of the N.I.D. angle that worked very well. The establishing shot used for P3S-114 (where Zarin lived) is a reused shot from Shyla’s planet — P3R-636 — in the Season Two episode “Need.” The people and the mine entrance have been removed in the revised shot. VOTE! How would you rate SG-1's "Endgame?"